Happy April Fool’s Day! Although we have some snow in the upcoming forecast, I hope it won’t be as deep as this snow that Tracey Buyce photographed her dog Roxy in. In addition to photographing her dogs, Tracey is an amazing equine photographer as well as a wedding photographer. She recently wrote an article for Popular Photography: How-To: Include Pets In Your Wedding and Engagement Photos. 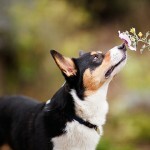 To see more of Tracey’s dog photography, check out her pet gallery. About Tracey Buyce Photography: Based in Saratoga Springs, Tracey specializes in wedding photography as well as equine photography. She also takes some terrific dog photos! Oh my gosh, that dancing poodle is my spirit animal! 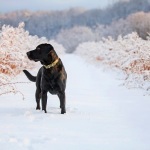 What a great photo, I’ll bet Roxy loved being buried chest deep in snow! So cute. The snow photo is beautiful and the poodle is awesome! 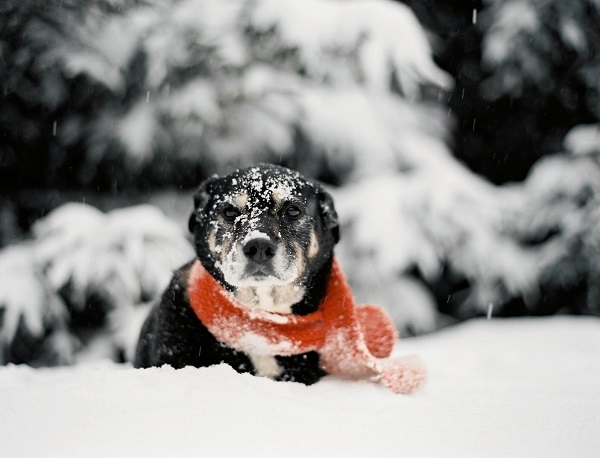 I love the snow photo with the dog wearing a scarf. Precious! Including dogs in wedding ceremonies is really cool too and I’d encourage it! Wow, that video sure is something else! And what a gorgeous picture that Tracey took. I really liked the video and thought it was perfect for April Fool’s Day. that dancing poodle is awesome!!! and you always have the most stunning photos! Thanks, I had fun trying to choose a video that was a little different! Wow, that is a really well done photograph. Snow is so hard due to how it reflects the light. When was this taken? Is it still snowing there? SEND SOME. Tracey posted that photo to her Instagram account in December I believe, but I woke up to a lot of snow this morning. Our yard has been bare for a while, but today its white! Wow! What an amazing video and that photo is stunning! We’ll see em at BlogPaws in June!! Woot – you are such an inspiration to me and I am blessed for knowing you! We have a little snow here but nothing like that LOL. Looking forward to some of those upcoming events. It is snowing and cold here in Michigan. Of course, our weather doesn’t ever seem to care what season it is. LOL That is a beautiful photo. It is amazing how much snow can really help a photo! That’s quite some snow! It’s a lovely snow portrait. The scarf is a nice touch.